The traffic pattern on Highway 6 at the Brittany Woods subdivision will change on Friday, January 11th so that cars will begin traveling in the outside lanes of traffic. This means that cars will need to merge into the right-hand lane in advance of the lane-closure. This is opposite of what motorists have been doing for the past 6-8 weeks. Please use caution in this area as motorists adjust to this change in traffic pattern. 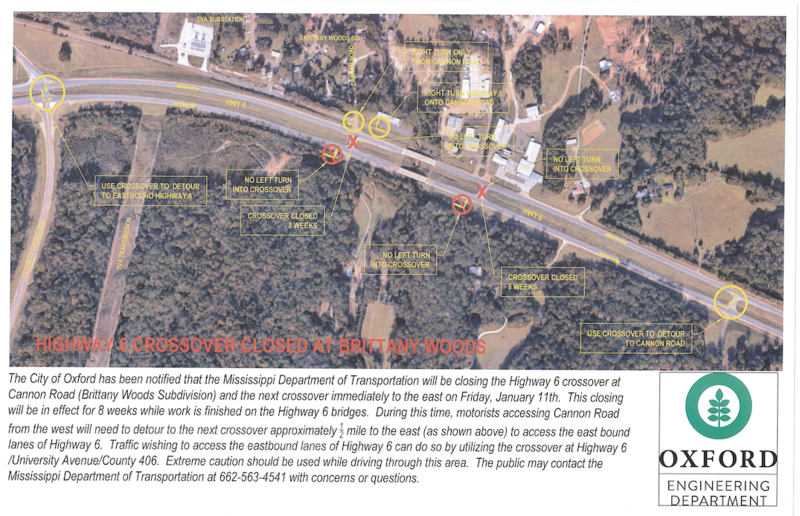 The crossover at Brittany Woods Subdivision will be closed as previously reported. This work is expected to take approximately 8 weeks to complete. Please contact the Mississippi Department of Transportation for additional information.